A flyer inviting students and their family for a picnic to take place on the Great Lawn. List of events for the festival. Program for Renaissance week and a list of coordinators. Booklet for Alexander's retirement with a program and a dinner menu. Invitation from President and Mrs. Anthony R. Santoro for a cocktail party. Booklet with a schedule of events for the dinner meeting of the Legal Studies Advisory Committee. 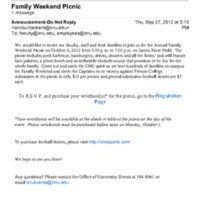 An email invitation to the Annual Family Weekend picnic to held on October 6, 2012 at CNU.